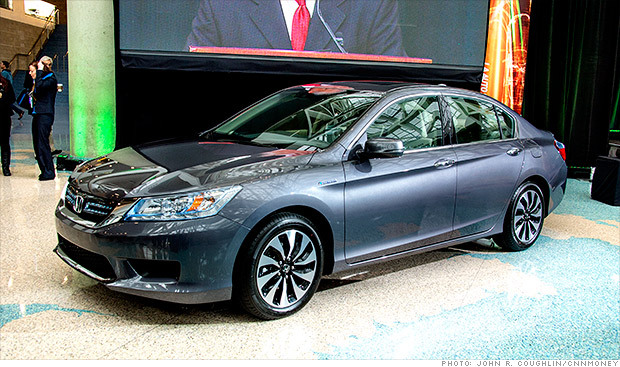 The 2014 Honda Accord is the 2014 Green Car of the Year and the award, it was announced Thursday at the Los Angeles Auto Show. Accord was picked by a jury of industry executives and celebrity Jay Leno. "This car offers something for everybody," said Mike Accavitti, an American Honda senior vice president, including a version that gets 50 miles per gallon in city driving. The Accord was a finalist in a field that included two diesels: the Audi A6 TDI and BMW 328d, as well as the Mazda3 and Toyota Corolla. Detroit's automakers were shut out of the short list. Last year the Ford Fusion was named the winner and among the finalists was the Dodge Dart Aero. The finalists were also unusual in that it did not have a single model that is sold only as an electric. The Honda Accord, built in Ohio, is available with a choice of powertrains including a four-cylinder, V-6, hybrid and plug-in hybrid. "It's all about fuel efficiency so this is a testament to our efforts that we're on the right track," Accavitti said in accepting the award. As for the Accord's award, Accavitti said the green car title is a testament to the kind of company Honda is and it will help them sell cars. Ron Cogan, editor of the Green Car Journal which presents the annual award, says as demand builds for clean and fuel-efficient vehicles, automakers will make more of them. No one knows which technology will provide the ultimate solution, Cogan says, who applauds the industry's pursuit of everything, including hydrogen. "The market always picks the winners and losers," Cogan says. As for the 2014 Green Car finalists, "the diversity of this field of finalists illustrates not only that green has gone mainstream, but also that there is no single approach to achieving ever-higher levels of fuel efficiency and environmental performance," Cogan says. •The Audi A6 TDI has a 3-liter, six-cylinder diesel, lightweight body and a start-stop system to further improve fuel efficiency. The sedan gets 38 mpg on he highway. •The BMW 328d has a four-cylinder diesel and gets 45 mpg on the highway and has a start-stop system. •The third generation of the Mazda3 is lighter and has SkyActive technology. With the 2-liter engine the compact car gets 41 mpg on the highway. •The Toyota Corolla, new for 2014, gets 42 mpg on the highway with its Eco version that has a 1.8-liter engine.